Application - Petroleum based hydraulic oils, water, glycol antifreeze solutions, and engine lubricating oils and air. 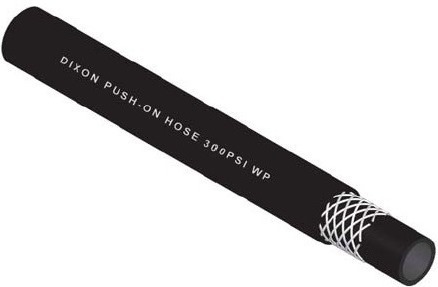 This hose is not recommended for pressure surge applications or critical applications, such as permanent piping in residential or commercial buildings. Do not use for Gasoline or diesel fuels. (Nitrile– Type C) highly resident to Oil & Heat. The Dixon brand of product like industrial hoses, delivery couplings and air fittings is synonymous with quality, durability and safety. We manufacture an extensive range of products which is the benchmark of quality, world wide. Dixon’s commitment to the core values of dependability, reliability, performance and safety have made ‘Dixon’ the brand of choice all over the world for almost 100 years.Sale on Dixon Products.